Nationally renowned artist Donald Lipski has created a clock tower for the entrance to the new El Monte Station. The clocks, which were manufactured by a family-owned company that has been in operation since 1842, are functional and light up at night. Each clock has two faces, one with a Metro logo, which greets passengers boarding at the station, and the other with the El Monte City seal, which passengers see as they leave the station. The clocks are suspended by a cable system within a graceful stainless steel arch approximately 30’ high and 20’ wide. The new El Monte Station replaces the El Monte Transit Center, located 12 miles east of the city of Los Angeles at the corner of Santa Anita Avenue and Ramona Boulevard in the City of El Monte. The center provides transit service on numerous lines for Metro, Foothill Transit, LAX FlyAway airport shuttle and Greyhound, and serves 18,000 customers a day. "Besides the utilitarian function of seeing the time, a clock tower establishes a focus, a sense of place. The very idea of a public clock speaks to history, stability, tradition and community. I will use street clocks based on a 19th century design, but used in a very contemporary and surprising way: three individual historic styled street clocks float aloft, suspended in a "web" of stainless steel cables. 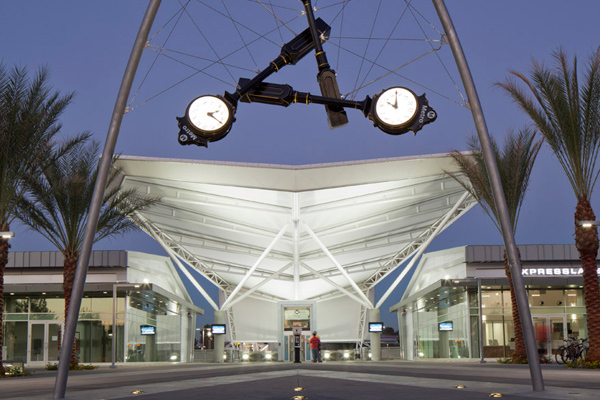 While the clock refers to and reflects the historic roots of El Monte, the sleek, minimal arch complements the new station's architecture, and propels these traditional clocks into the present day." DONALD LIPSKI has completed numerous large-scale public artworks across the United States, and is represented in the collections of some of America’s most esteemed museums, including the Metropolitan Museum of Art (New York), Walker Art Center (Minneapolis) and the Chicago Art Institute. He received the Rome Prize from the American Academy in Rome in 2000.